Our Halloween t-shirts and socks are 40% off, mention that you saw it in our blog and receive an additional 20% off! We will be closing an hour early at 5 PM on Saturday, October 31 so that all our ghosts and goblins here at Junior Towne can get safely home for the evenings Halloween revelries. With snow in the forecast (finally) for tonight, we just received a new shipment of Molehill shelled booties and mittens. Don’t forget-we carry the down slippers from Molehill mountain to keep little feet extra warm around the house or preschool. 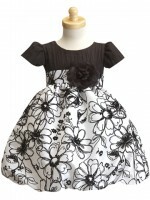 Our Christmas dresses have arrived from Jessica McClintock, Biscotti, Lito and lots of others. Now is the time to come in while selection is at it’s best! One of the things that we hear repeatedly is that parents want non-scary costumes for their children at Halloween and throughout the year. It is our opinion that a child is benefited by toys that encourage their imagination and creativity. One of the “toys” that that do this are costumes. Cowboys, astronauts, princesses, ballerinas-all encourage safe, make believe worlds that can enrich a child’s mind. Those of us of a certain age (you know who you are) remember twirling around in our bouffant slips or creating robot costumes out of boxes. What fun! PS- The National Federation 2009 Halloween Consumer Action Survey says that 4.5 million princesses are showing up for Halloween this year! However, for real warmth on a cold Alaskan day we suggest Smart Wool infant socks or booties (they make great hat and mitten sets, too) on the inside. On the outside we suggest the waterproof breathable shelled booties from Molehill. 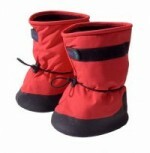 We especially like the soft polar fleece on the interior and the velcro adjustment around the top. The bottom sole is soft with a nonskid surface. 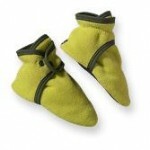 With the toggle at the ankle, these booties are easy to get on and really stay put on little feet. Thanks for the inquiry and yes, we do ship to Massachusetts! Ahhhhlasaka! 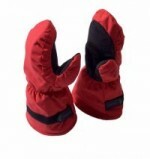 With fall upon us and termination dust creeping down the mountains, please remember that we have a good selection of “inbetween wear,” such as polar fleece mittens, Bogg boots, polar fleece jackets, capilene long underwear and much more to keep your children warm during our “inbetween” time. Our winter gear is all here, one and two piece snowsuits from Obermeyer, Pataglonia, Columbia, and Jupa. Smart Wool and Wigwam socks, a huge variety of Sorel and Striderite boots and our bestever selection of warm hats. 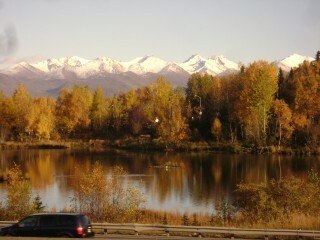 Since we live here, too, we know what it takes to keep little Alaskans warm all winter long. What a beautiful state and how well-b;essed we are to be here! You are currently browsing the Junior Towne Blog weblog archives for October, 2009.